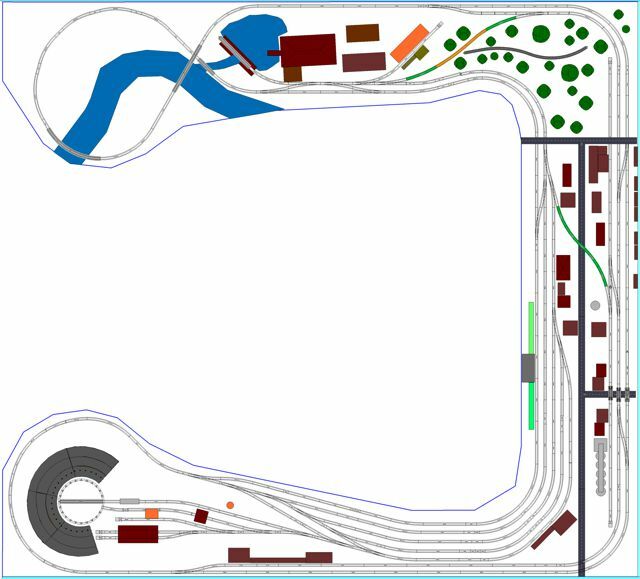 Large U-shaped N-scale layout featuring a train station in curve, turntable with roundhouse, grain elevator in the center area and lumber mill near the river’s bank. ﻿The Southern Pine Railroad Layout is based on the end of the era of the Lumber Barons in eastern Texas in the late 1920's-mid 1930's. These are the days of The Great Depression in the USA and just before the discovery of oil in the same area. The town is based on Longview Texas and the yard would be in Palestine Texas. The abandoned track area (the gray colored track inside the wood) is near Diboll Texas where there are several abandoned towns that served the lumber industry. The lumber mill is one of many that sprang up on the Neches river and was then abandoned. Contrary to the popular view around the world, eastern Texas is low rolling hills covered in tall pine trees. The rough dry and rocky Texas seen in movies is on the western side of the state. The layout is constructed with KATO N Unitrack pieces and will be operated using DCC. Check also the Andy’s topic Southern Pine is back in Texas! Layout Design Thread in Nscale.net forum in order to see more pictures of the real layout and to follow the building progress.